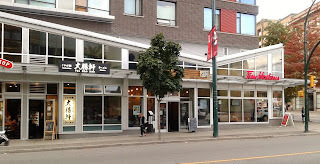 In Vancouver, there are rich neighbourhoods and poor neighbourhoods, but Tsuki Sushi Bar is located in one of those few places with a nice amalgam of the rich and the poor. 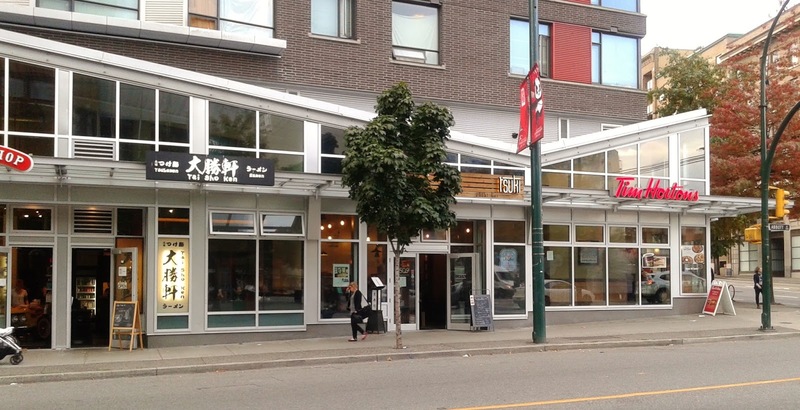 On one side of Abbott St., there is a row of modern-themed, higher-priced restaurants, while on the other side, there is International Village, which is surrounded by people with discoloured hair who like to hoarsely yell at seemingly nothing. These people need more sushi in their lives. 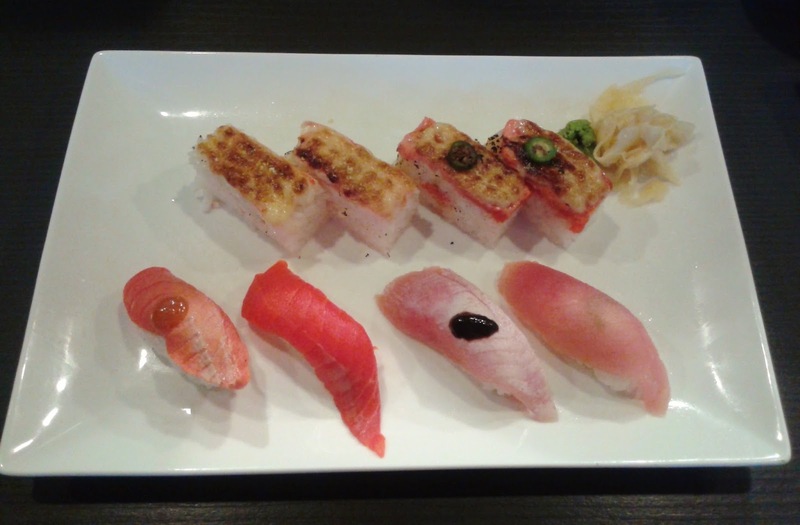 Around 80% of Tsuki Sushi Bar's menu consists of sushi and sashimi. There are a large assortment of special rolls (called "craft rolls" on the menu), which include the Slug. Mmm, slug sushi... However, being the die-hard Aburi sushi fan that I am, I decided to start with the Oshi Sushi Combo, which featured two types of oshi sushi, four types of nigiri, and a salad. 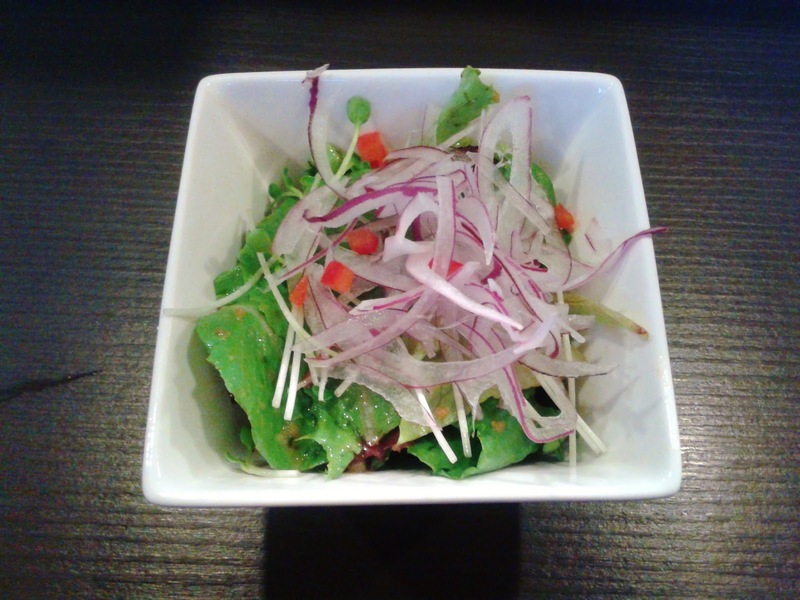 The Green Salad came with assorted greens dressed with a strong, tangy Japanese dressing. There was only a small amount of dressing, but it had enough impact to provide adequate flavour to the entire salad. 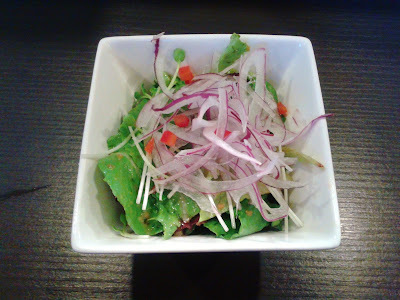 The addition of daikon and red onion gave the salad a nice zing. Starting with the top-left, the Ebi Oshi Sushi came with some meaty pieces of shrimp, which were dressed with a savoury in-house oshi sauce. Crab meat was inserted into the block of sushi rice to enhance flavour. Next, the Salmon Oshi Sushi was decent with a soft layer of salmon on top and some flavourful seasoned rice on the bottom. The sushi rice could have been packed a little less tightly, but it wasn't far off. Both the Sockeye Salmon Nigiri and the Tuna Nigiri tasted fresh (the tuna a little more so than the salmon). The seared pieces of nigiri were lacking a smoky flavour, but the dab of miso sauce on the salmon and the touch of seaweed paste on the tuna helped liven up the flavours a bit. The Red Heatwave is a torched roll that comes with red tuna, cucumber, spicy mayo, green onion, and jalapeño. The pieces of jalapeño, although small, were spicy enough to be used in a daring game. Unfortunately, the jalapeño kept tumbling off the top of the roll, so when I subconsciously put a few bits of the pepper into my mouth, instant death struck my tongue and my throat. It was hard to enjoy the texture of the expensive red tuna due to the copious amounts of cucumber, and there was no way I could tell what the tuna actually tasted like. After rinsing my mouth with lots of green tea, I tried the Gindara Saikyo (Garlic Miso Marinated Sable Fish), which turned out to be surprisingly good! It definitely tasted better than it looked. 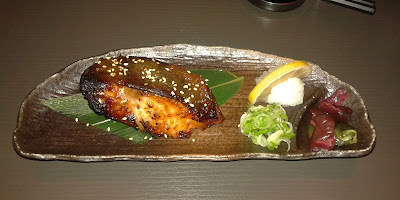 The sable fish was very juicy and silky, and the miso sauce added a delicious sweet edge to the soft, savoury fish. The temperature at which the sable fish was served was just perfect. Who would have thought the best item of the meal would be one of their very few cooked items? The service was friendly and very attentive from beginning to end. One of the servers even offered me a basket to put my backpack in so that I wouldn't get it dirty by sliding it around on the ground. Most importantly, the servers kept refilling my green tea (which was above average) so that I could wash down the spiciness from the Red Heatwave. As for the sushi, it wasn't the best I've had, but the sushi chefs put substantial effort into constructing and presenting the sushi neatly. 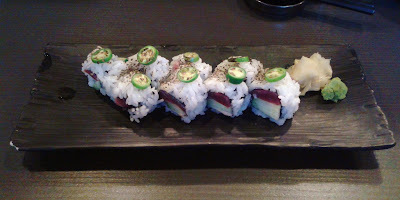 Ah great to see finally got a chance to try Tsuki and pleased to see you liked it. I'm glad I finally got around to trying it!